Alright already. I forgot to change the date on my watch. I'm a whole 24 hours off. I thought today was the 4th of October. Why can't we have a set number of days in a month? That would make keeping track of the date on my watch much easier -- I wouldn't have to keep fixing it every two months. 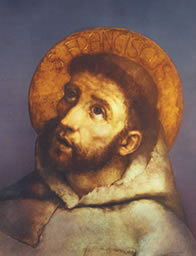 Anyway, Happy belated St. Francis Day. Here are two prayers of Francis' that I like. I hope you do too. The Prayer of ST. Francis before the Cross at San Damiano. Most High glorious God, bring light to the darkness of my heart. so I can always observe your holy and true command. Amen.